Apple's mysterious WWDC 2016 announcement: What does it mean? For as long as Apple has designed creative invitations to its media events, geeks have treated them as the technical equivalent of a Rorschach test. 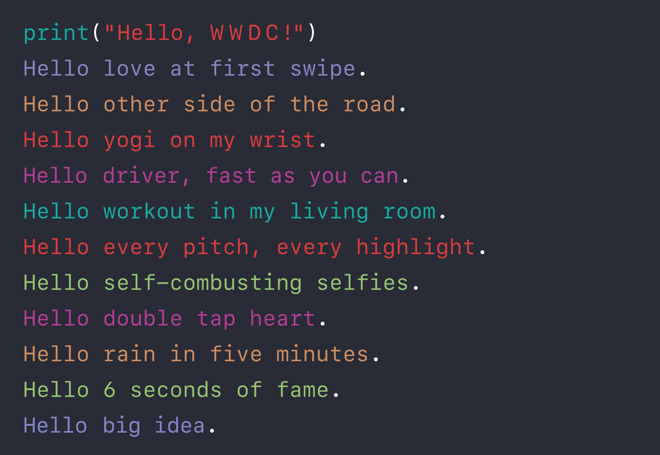 What secret clues might Apple have hidden in the latest WWDC missive? Probably nothing. This year's Worldwide Developers Conference announcement is somewhat more subdued than a typical Apple invitation. Instead of a fancy graphic, Apple has made liberal use of its new Swift language to highlight successful apps. Tinder, Crossy Road, Uber, MLB At Bat, Instagram —"double tap heart" is a personal favorite —and Snapchat are among those singled out. It's the mysterious 11th line, though, that has many people perplexed. It simply says "Hello big idea." As it's the 11th line, some argue that it prefaces a plan to bump OS X to OS XI. The word "big" is thought by others to represent "the next big thing," perhaps a new product line or unforeseen Mac hardware updates. In reality, it probably doesn't mean anything. WWDC is nearly as important for Apple as a marketing event as it is as a technical conference. With mobile devices increasingly becoming "good enough," the app ecosystem is one of the primary things keeping customers loyal to a single platform. This means that Apple needs developers to continue developing for iOS —which is now Apple's core product —in order to keep its competitive advantage over Android. Thus, the meaning of "line 11" is probably exactly what it seems like to a rational human being: Apple's attempt to convince developers that they might just have the next Vine on their hands, if only they release a nicely polished iPhone app.